First Pres welcomed our Ninth Cohort of Resident Ministers on August 15, 2017. Blair Buckley, Eric Koenig-Reinke and Rev. Dorothy Parks-Piatt arrived full of energy, vision and passion for ministry and leadership here in Ann Arbor and immediately began an intentional process of on-boarding here into the life of First Pres. This cohort is more keenly focused on young adult and college ministry, social justice issues, teaching opportunities, congregational care and ministry to all generations than previous groups. They hope to be involved with Deacons, Congregational Life, Stephen Ministry, New Members and other programs, all new areas of ministry for Residents. 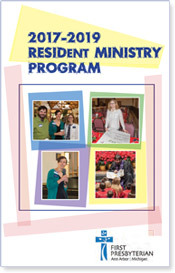 View the 2017 - 2019 Resident Minister Brochure here. Dorothy was ordained on Sunday, July 9 in her home church, New Hope Presbyterian Church in Chattanooga by the Presbytery of East Tennessee. In a festive worship service attended by old and new friends and colleagues, she was commissioned to a life of service and witness as a Teaching Elder in the Presbyterian Church USA. Eric will be ordained on Sunday, October 29, 2017 in Noble Road Presbyterian Church, Cleveland, OH, his home church, by Western Reserve Presbytery. Both of his parents, Presbyterian pastors, will be involved. Eric is married to Essie Koenig-Reinke, our Youth Ministries Coordinator. Blair will be ordained on Sunday, November 5, 2017 in Faith Presbyterian Church, Colorado Springs, CO, her home church, by Pueblo Presbytery.